Andy Murray of Britain returns to Novak Djokovic of Serbia during the Men's singles final match at the All England Lawn Tennis Championships in Wimbledon, London, Sunday, July 7, 2013. From the lawns of Wimbledon to the lochs of Scotland, all of Britain can celebrate. "Imagine playing it," Murray said. On a cloudless, 80-degree day on Centre Court, Murray put his name beside that of Fred Perry, the last British man to win Wimbledon, back in 1936. The second-seeded Murray beat the best in Djokovic, a six-time Grand Slam winner known for both a mental and physical fitness built to handle what he faced Sunday: A crowd full of overheated partisans rooting against him, to say nothing of Murray himself. The loss in last year's Wimbledon final "was one of the toughest moments in my career, so to manage to win this tournament today," Murray said, letting the thought trail off. When he finally wrapped it up, he let his racket fall to the turf, took his hat off and pumped his fist toward the crowd. Later, he climbed to the guest box where his girlfriend, Kim Sears, and his coach, Ivan Lendl, were among those sweating this out. Born a week apart in May 1987 — Djokovic in Belgrade when it was part of Yugoslavia, and Murray in Glasgow, Scotland — these top two players are building the best tennis rivalry of the 2010s. This was their third meeting in the last four Grand Slam finals and all have been riveting affairs. Djokovic went up a break in both the second and third sets and, both times, appeared to have grabbed at least a bit of control and quieted a crowd that included Prime Minister David Cameron. But Murray dug out of both holes. In the second set, he set up break point with a sharply angled forehand that Djokovic couldn't handle, and the Serb responded with a double-fault, one of four on the day. In the third set, Murray lost four straight games to fall behind 4-2, but got the break back and — eventually — closed it out by winning the last four games. Trailing 5-4 in the third, Djokovic rushed out to the court after the break — a man who seemingly wanted to get it over with. Murray quickly went ahead 40-0 and it looked to be all but over. But the next few minutes felt like forever. Djokovic saved the first three championship points, then had three break opportunities of his own. Couldn't convert any. Then, finally, Murray put it away when Djokovic put a backhand in the net. A few minutes later, the 26-year-old Murray was kissing the trophy. "I don't know how I managed to come through that final game, it was unbelievable, three match points," Murray said. "I'm just so glad to finally do it." Djokovic came into the match on the heels of a 4-hour, 43-minute semifinal victory over Juan Martin del Potro in similarly parched conditions. "It took a lot out of me but I cannot look for excuses in the match two days ago," Djokovic said. "It went five hours and five sets but I've been in these situations before. I felt OK."
Indeed, he rarely wears out, but Murray and the linesmen succeeded in puncturing his typically calm demeanor. 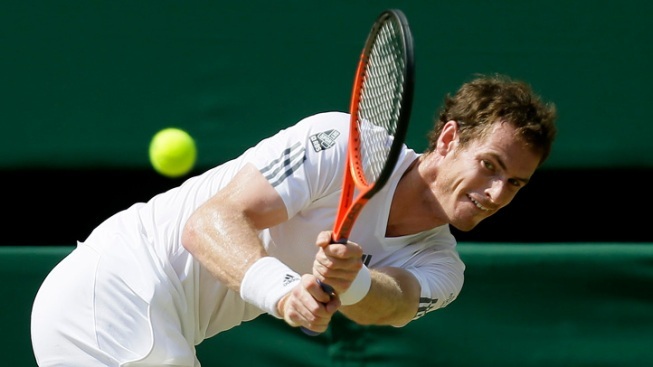 Murray's withering groundstrokes and his patience from behind the line helped him take the first set. Then slowly, Djokovic shifted his strategy, mixing in drop shots with frequent trips to the net — neither of which are considered his specialty. He won 30 of 52 trips to the net, compared to 26 for 37 for his opponent. "I lost crucial points at the net," Djokovic said. "You don't get many opportunities against him." Djokovic also finished with 31 winners against 40 unforced errors — an uncommonly bad ratio for the world's top-ranked player — compared to 36 winners and 21 unforced errors by Murray. Meanwhile, Djokovic found himself in an ongoing dialogue with chair umpire Mohamed Lahyani, as a number of close calls went against him. Djokovic had used up all three of his second-set challenges by the middle of the eighth game. At the end of that game, after another close call on the baseline went against him, Djokovic raised his hands toward the heavens, showing another trace of frustration that rarely hits him.